Ghosts really infected our literature in the 19th and 20th centuries with the rise of gothic fiction. That’s where a lot of the classic ghost stories come from. They were often influenced by folklore and take place in creepy old mansions (that are, of course, haunted), dealing with the psychology of the characters. Ghost stories are traditionally more about the dread created by the ghost’s presence as opposed to gore and physical fear for your life. Suddenly, horror movies pop up left and right that involve ghosts. Shirley Jackson’s novel was adapted to screen in 1963 with The Haunting. The Poltergeist movies gave us a sense of the danger and power of ghosts. Spanish movies like The Devil’s Backbone and The Orphanage depict ghosts as otherworldly in their creepiness, and though they were once human, now they are eerie and somehow wrong in their disconnect from the living world. These movies really capture the fear of that otherness of life beyond death, of the strange and foreign nature of people that are no longer quite human. Then we get some experimentation with the role of ghosts in movies as the classic ghost story begins to feel stale. What if the main character is a ghost? That’s explored in the cheesy romance of Patrick Swayze and Demi Moore in Ghost. But horror movies started to use this idea in their arsenal of shock: what if the main character doesn’t know he/she is a ghost? Enter The Sixth Sense, which had everyone talking about the clues throughout the movie hinting that [SPOILER] Bruce Willis was dead the whole time. The Others was another one that caught people off guard; here we are, enjoying a throw-back classic ghost story, when we learn that [SPOILER] the “intruders” are really living people and Nicole Kidman smothered her children with pillows! Haley Joel Osment sees dead people. The “they were really ghosts all along” twist has now been done to death it seems, but it was quite fresh and innovating when it first appeared because it had the audience sympathizing with what is usually the monster in horror tales. But people are never satisfied with seeing the same thing over and over again, so ghosts had to be reinvented again, this time on the small screen. A slew of reality ghost hunting/reenactment shows now graces channels like Travel, Sci-Fi, and even Discovery. The latter has a show called A Haunting, which reenacts “true” stories of hauntings with interviews from the real people. There have been several shows that explored various creepy locations around the world and the history of their hauntings (one of which was voiced by Zelda Rubinstein), and sometimes locked families into the locations at night to complete tasks that tested their fears. These bros just want to bro-out with some ghosts. And yell "dude" a lot. People like the idea of ghosts. Why? Well, first of all, evidence of ghosts would be evidence of life after death, but also, a lot of people are scared by stuff that could be “real.” Reality shows that look for evidence of real ghosts and faux-documentary movies like Paranormal Activity allow audiences to really believe, rather than just suspending disbelief. And ghosts are a lot better for this because, if you believe in the afterlife, then the existence of ghosts is entirely possible (unlike, say, vampires or werewolves). 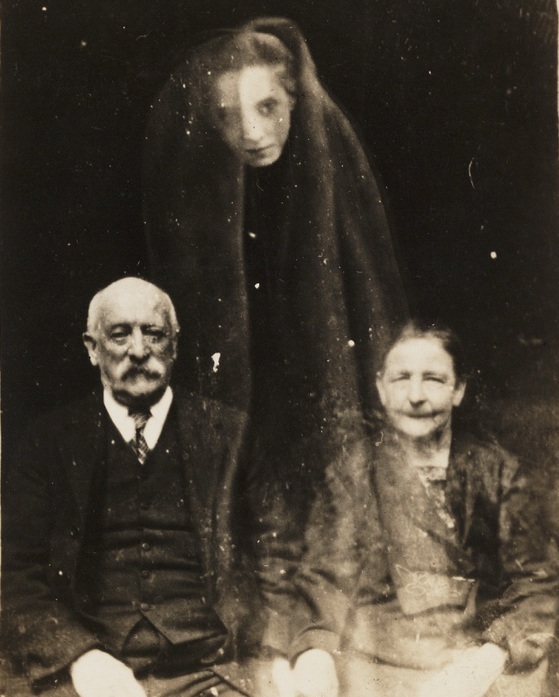 Very interesting history and usage of ghosts. This time two years ago, I was hearing about our local ghost stories from my classmates, which they heard through their students. At the university we supposedly have a hitchhiking ghost, whom jumps into the backseat of a car that stops for her and disappears when asked where she needs to go. And downtown we have the Lady in Red who was killed outside of her hotel in her favourite red dress, and apparently goes into her old room frequently. People have complained to the front desk about their room being occupied by a lady who doesn’t even acknowledge other patrons, until they realise she’s a ghost. Hm…most of thse urban legend ghost stories seem to surround female ghosts, or at least it feels like it. Don’t hear often about a man in red haunting hotels or hitchhiking and vanishing mysteriously. I guess that speaks to higher rates for and the special attention to violence against women, more likely to meet the untimely ends that causes spirits to linger. I’ve not heard of the Woman in White (other than the Wilke Collins Victorian novel, which didn’t feature drowning children), so not a common story to me. Minding, Canada doesn’t have the Latin influences that the States does.